For over 20 years Mark Carrigan and Michelle Smith-Carrigan have been performing, teaching and inspiring children with the ancient art of puppetry. Serving as both Executive Director and Artistic Director the Carrigans have made it their goal to provide the most professional and educational programs they can create. As Writer, Producer, Director, Designer, Puppet Creator, Voice Talent and Master Puppeteers, Mark and Michelle have learned to utilize their many skills into one of New York’s premiere Entertainment Companies. Since 1994 The Puppet People have performed in over 3000 shows and have delighted audiences young and old. With 13 different shows to choose from, Mark and Michelle have tried to reintroduce children’s classic tales into our hectic modern world. Each show is carefully hand crafted and designed, taking almost a year to create. The Puppet People are known for incorporating many styles of puppetry into their performances, which makes each show distinctly different. The Carrigans have performed throughout the country, their travels taking them to countless schools, theaters, festivals, libraries, museums, community centers and churches. Mark and Michelle were even given the opportunity to perform at Lincoln Center in New York City. 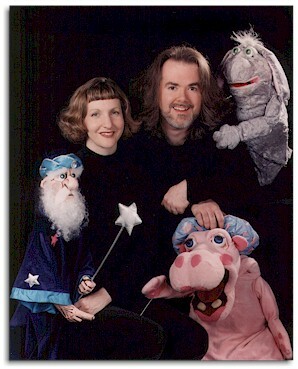 Besides The Puppet People, Mark Carrigan and Michelle Smith- Carrigan also perform freelance work as Voice Over Artist and	Puppet Builders. Their works can be seen in fairs and libraries in Texas, California, and Florida. Michelle’s Voice Over work can be heard in many local and national commercials as well as in animation and online games. It is the goal of The Puppet People to introduce the magic and wonder of Puppetry	and Storytelling to our children and by doing this creating family and community memories that will last a lifetime.